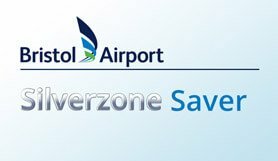 Bristol Silver Zone parking offers great value car parking within easy reach of the terminal at Bristol International airport. Pre-book your Bristol airport parking today, save money and guarantee a car parking space at the airport. Non Flexible option at the Silver Zone car park. Onsite parking ran by Bristol airport, 5 minute transfer time. Silver Zone car park is now run by the airport. Silver Zone is manned 24 hours and well lit. CCTV and Automatic Number Plate Recognition are also in operation. All cars remain on-site within the secure, fenced compound of Bristol's International official car park. If your actual stay is longer than your booked stay, you will be charged extras on departure at the car park's standard daily rate. No refund will be issued for part used stays and any additional time will be charged at the local gate rate. At the entry barrier to the car parks photographic equipment will take images of your car and registration number. Thebarrier will then rise automatically. Park in the arrivals area and make your way to reception with your confirmation.